After a four-day layoff, the Raptors were back in action tonight against the team currently chasing them in the Eastern Conference for that number one seed and home court advantage in the playoffs - the Boston Celtics. Heading into the game, with only seven games remaining in the regular season for both teams, the Raptors had a three-game lead against their division rivals who were also coming into the game on a bit of a roll winning five in a row. Fresh off winning four straight vs Western Conference opponents, with the most recent one being a buzzer beating three by Jalen Brown to lift the Celtics over the Utah Jazz. Entering the game, the Celtics had reinforcements back in their rotation, having Al Horford back in the starting lineup and Marcus Morris back on the bench. With Kyrie Irving still out due to injury, the young Terry Rozier started at point guard for the Celtics. 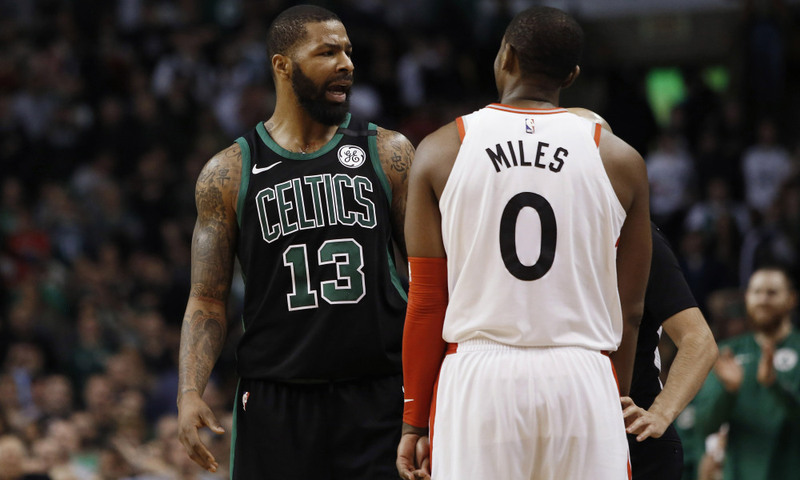 Also coming into the game, the Raptors and Celtics have, so far, split their season series between the two at 1 game apiece, with both teams winning each of those games on their respected home courts. Six minutes into the game, Raptors were in control and playing at their familiar tempo; fast-paced basketball that they’ve been playing all season long. But with the Celtics not going away easy, it was a back and forth first quarter with plenty of ties and lead changes all throughout. Toronto ended up having a slim margin lead on the Celtics, 33-31 after 12 minutes of play at TD Garden. Six of those 31 first quarter Boston points coming from Aron Baynes who hit two threes where he shot the three ball a combined 0/12 all season long until tonight. After such a high scoring first 12 minutes, the second quarter was different, with both teams only putting up a combined 44 points. Despite the Raptors putting up a 7-0 run with two minutes remaining in the second quarter, they had their biggest lead in the game (5-point lead) at that point. But the Raptors were ultimately leading the Celtics 55-53 in Boston at halftime. Coming out of halftime, the game continued to fluctuate with more ties and lead changes with neither team getting a real grasp on the game and taking a big lead. Although, with 6:52 in the third quarter, the Raptors gained their biggest lead of six points behind Jonas Valanciunas’ 13 points and ten rebounds and DeMar DeRozan’s 17 points, four rebounds and five assists at that point. The Celtics did battle back, tying the game and taking the lead within the final minutes of the third quarter. But Toronto battled back slightly when DeRozan took matters into his own hands. He scored another nine points in that quarter, including the final four points to regain a 2-point Raptors lead heading to the fourth and final quarter behind DeMar’s 28. Starting the fourth quarter for Dwane Casey’s squad was the bench unit, who wasn’t having the best night getting out-scored 27-14. Eleven of those 14 bench points came from Fred VanVleet. With the bench still struggling, there was a switch in momentum a few minutes into the fourth quarter with the bench not generating much on both ends. Raptors were quickly behind four with 8:43 to go and a Casey timeout was called. Coming out of the timeout, the Raptors got stops defensively and went on a 4-0 run with 6:32 to go to tie up the game once again. Norman Powell received key minutes down the stretch due to horrible lack of play and production from CJ Miles who went 0/6 on the night and had four turnovers. Not an ideal night from the Raptors guard and something the fan base hasn’t seen all season. Despite Toronto tying the game with 6:32 to go, the Celtics once again pulled away, gaining a six-point lead with four minutes to go in the fourth quarter. It wasn’t looking too good for Toronto as Boston continued to have their foot on the gas, now extending their lead to eight with 3:30 to go currently being on a 12-2 run. From there, the Celtics never looked back. Marcus Morris singlehandedly out-scored the Raptors bench putting up 25 points compared to the 20 bench points put up by Toronto. It was a fourth quarter disaster for Toronto as they were out-scored by a total of 13 in the quarter, shooting 7-21 (33%) and 1-10 from three with a team combined 7 turnovers. It also didn’t help that Toronto scored only five points in the final seven minutes. With the final seconds ticking down and the Celtics up 11, the game got a little scrappy. A bit of a scuffled occurred between Marcus Morris and Miles, which resulted in a foul called on the latter. Morris then got into Miles’ face which concluded in both of them picking up double technicals. With Morris heading to the free throw line, he then proceeded to pat a referee on the back side and reportedly saying “good game," leading to an ejection from the game. Although it didn’t change much in the outcome of the game, the Celtics ultimately defeated the Raptors 110-99 behind DeMar DeRozan’s 32-7-7 game and have cut the Raptors first place lead in the east to just two games. The Raptors now move on to Cleveland where they visit LeBron James and the Cavaliers on Tuesday. They then find themselves back home the day after for another, but final meeting with the Celtics this regular season. This first-place lead for Toronto can quickly disappear with six games left on the season. If Boston defeats Toronto in their next meeting, the Raptors will lose the tiebreaker, as Boston will earn the season series between the two and will then go on to finish first in the conference.